In Part 1, we talked about a situation where you, as the owner of Cheeky Chicken, are thinking of buying a new chicken deep fryer worth 4 million pesos and is expected to bring in additional profits of 1 million pesos per year; "additional" means if you already earn 2 million pesos with your existing set up, you expect to earn a total of 3 million pesos per year with the new machine. In making capital budgeting decisions, you should not focus on your total earnings (3 million), but rather on the additional or incremental cash flows you expect the investment to generate. 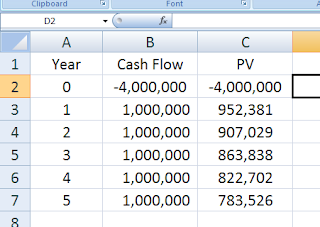 To better visualize the situation, let's summarize the cash flows into a table. 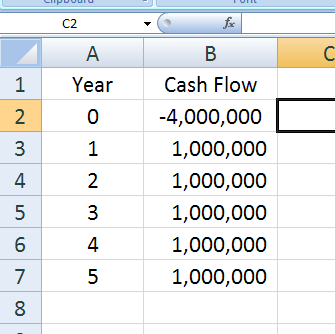 The negative 4,000,000 cash flow just means that it is a cash outflow and Year 0 means today or now. 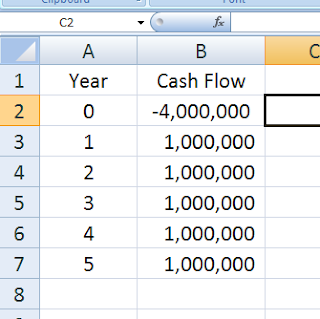 As we explained briefly in Part 1, we can't just add the future cash inflows and compare the sum to the required investment because of time value of money: we have to convert all the cash flows to a common time reference, given the rate of return of a comparable alternative investment, before we can compare the costs of the investment (cash outflows) to its benefits (cash inflows). 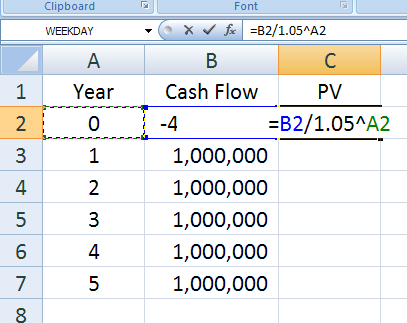 And the easiest way to do this would be to determine how each cash flow is worth today by getting its present value. For example, if you can earn 5% per year on an alternative investment, compounded annually, how much would you need now to have 1 million pesos by the end of the year? If you answer 952,381 pesos, you're right; you get that by dividing the future value, which is 1,000,000, by 1 plus the rate of return, or 1.05. 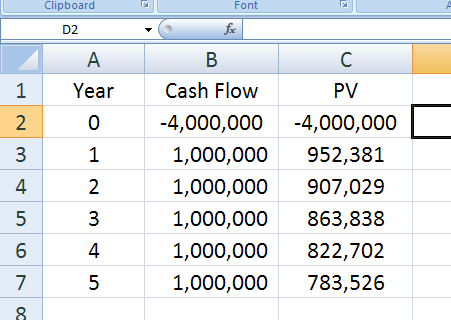 So, we say that 952,381 is the present value of the 1,000,000 cash flow in Year 1; alternatively, we can say that we need to invest 952,381 today at 5% per year to have 1,000,000 by the end of the year. Which gives us present values of 907,029 and 863,838 to the cash flows in Years 2 and 3, respectively. If you're allergic to this kind of math (who isn't, right? ), then there's always Excel. 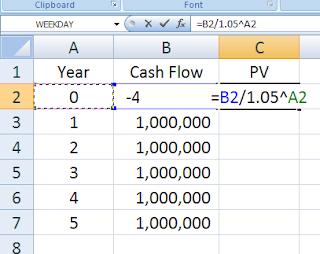 Notice that farther away in the future a cash flow is, the lower its present value; this is just consistent with our definition of time value of money, that earlier cash flows are more valuable than later cash flows. 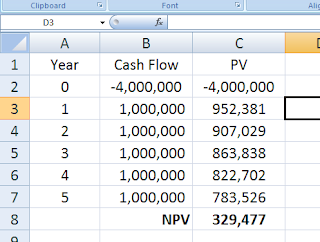 Finally, to be able to decide whether it's a good idea to buy that new fryer or not, just add the present values of all the cash flows and get the net present value or NPV of the investment. A positive NPV means the benefits of an investment outweigh the costs, considering time value of money, so you should accept or go through with the investment; a negative NPV means you will be better off investing in the alternative investment instead. In our Cheeky Chicken example, since the deep-fryer has an NPV of positive 329,477 pesos, then it makes good economic sense to pursue the venture; buying the machine would provide an additional value of 329,477 pesos, on top of 5% per year which is some sort of benchmark return. The future incremental cash flows the investment or project is expected to generate. The rate of return of a comparable, alternative investment. 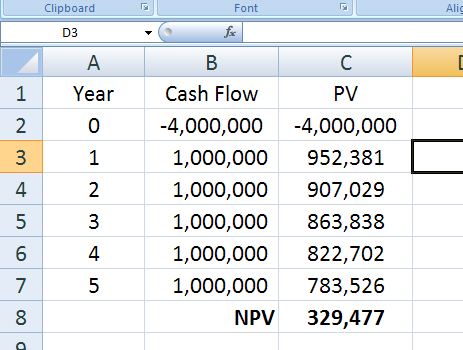 Therefore, the reliability of your NPV calculation is just as good as your estimates of these two inputs, and as they say, garbage in, garbage out. In practice, these two inputs are not easy to estimate accurately; still, you should be able to come up with reasonable assumptions that will make your computations more believable. Do you think this is too much trouble for a piece of kitchen equipment? Actually, while most books recommend the use of NPV in capital budgeting, most businesses use other, more informal alternative criteria. And that's what we will talk about in Part 3.